If you’d like news about my latest book or upcoming releases or just want to keep in touch, please add your name to my mailing list*. PS! 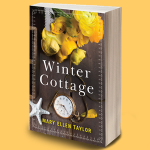 Be sure and add mary@maryellentaylor.com to your list of accepted email addresses. *By filling in this form you agree to receive email news from Mary Ellen Taylor. You can unsubscribe at any time at the bottom of any of our newsletters.